yesterday we were supposed to get a crazy snowstorm in nashville. hours before snow even materialized, schools had already closed for today + businesses said they weren’t going to open. we made sure we bought food for the next few days + settled in for a big snowy evening. well, i’m writing this at 10 PM on sunday evening, + nary a flake of snow has fallen. i was ready for the snowpocalypse of 2011, but it looks like it ain’t happening. sad! the good thing? 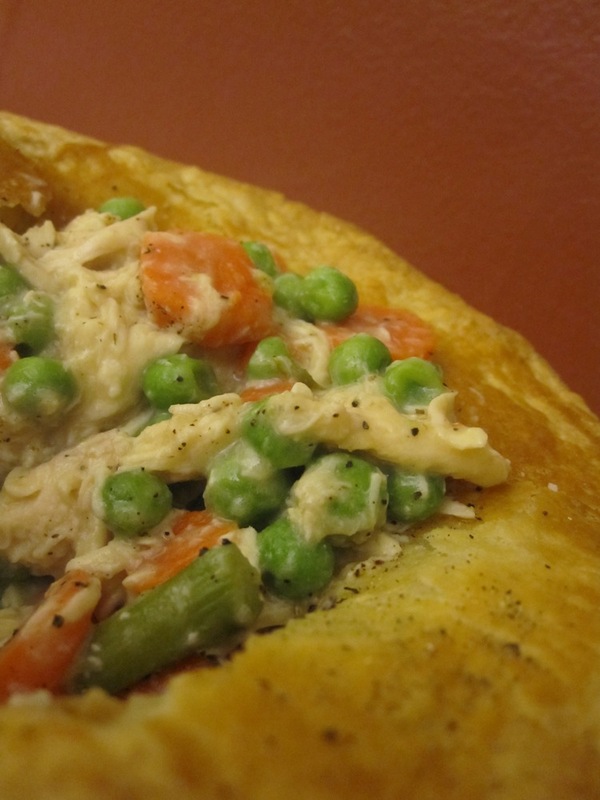 we planned a snowy evening meal: individual chicken pot pies. seriously, if you want a meal that screams warm, cozy homeyness, chicken pot pies immediately pop to mind. + these? they are AMAZING. honey, who is normally a fairly slow eater, chomped his down at record speed (as did i). note – if you can’t find crème fraîche, you can substitute sour cream without upsetting the flavor. the veggie to chicken ratio is perfection, + the spices/seasonings are absolutely divine. enjoy! season the chicken stock with salt. bring to a boil in a small saucepan. add the carrots, reduce the heat to medium, + boil gently for 4 minutes. remove the carrots with a slotted spoon + transfer to a bowl with the peas + asparagus. set aside. make the sauce. in a medium, heavy saucepan, melt the butter over medium-low heat + add the flour. stir together with a wooden spoon + cook until the roux is just beginning to color, about 3 minutes. remove from the heat + whisk in the chicken stock all at once. return to medium heat + bring to a simmer, whisking constantly reduce the heat to low, simmering for 15 minutes, stirring often to make sure the sauce doesn’t stick to the sides + bottom of the pan. season to taste with salt + pepper, + remove from the heat. stir in the sage + set aside to steep for 5 minutes. whisk in the crème fraîche. butter four 1-1/2-cup ramekins (or a two-quart baking or souffle dish). scrape the sauce into the bowl with the chicken + vegetables + mix together thoroughly. distribute among the 4 ramekins or baking dish. cover the ramekins/dish with plastic wrap + place in the refrigerator while you roll out the puff pastry. roll out the puff pastry into a thin square or rectangle large enough to cut into 4 equal pieces that can be draped over the ramekins (or 1 piece to drape over the baking dish). whisk the egg + water together + brush the outside rim of each ramekin/dish. set the pastry on top with the dough draping over the sides. press around the sides of the ramekins to seal + pinch an attractive lip around the edges. pierce the top with the tip of a paring knife + set in the freezer for 20 minutes. meanwhile, preheat the oven to 425°F. place the ramekins/baking dish on a sheet tray. brush the tops with the egg wash + place in the oven. bake until golden brown + bubbling, about 20 minutes for individual ramekins, 30 minutes for one baking dish. serve hot, in the ramekins. 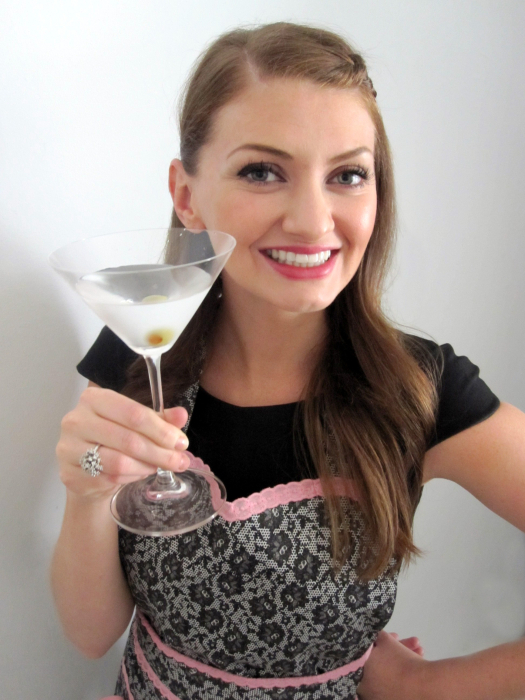 i just checked out your blog + you have some amazing recipes on there – i’m thrilled i have another foodie blog to follow. the perfect snow day treat! i’m home from work today, so this will be the perfect time to cook. thanks again! yay for snow days! let me know what you think of it! it’s official: this pot pie recipe has now entered the standard recipe rotation. my parents absolutely loved it for a cold winter day’s lunch. i did have to make some substitutions–couldn’t get to the grocery store in the snow!–but it still worked beautifully. (actually, i think it would be great with almost any combination of vegetables! it’s going to be fun to experiment.) this time, i used a bag of frozen mixed vegetables with peas, carrots, corn, and green beans, as well as the called-for amount of peas, and cooked them in the chicken broth for about 5-6 minutes. i used 1/2 cup of finely diced white onion, and added 2 small yukon gold potatoes, also very finely chopped. had to use a few sprinkles of dried sage, and sour cream. the puff pastry was absolutely perfect–flaky and delicious, and not too “crusty” or overbearing. dad’s already asked for another pie later in the week. awesome! this is definitely entering our fall/winter dinner rotation, too – i was really pleased with it. one thing that i’m going to do next time is to add in a few diced potatoes, preferably yukon gold (just like you did). i really like potatoes in a chicken pot pie + i think it would be a nice touch. i’m so glad that you all enjoyed it! 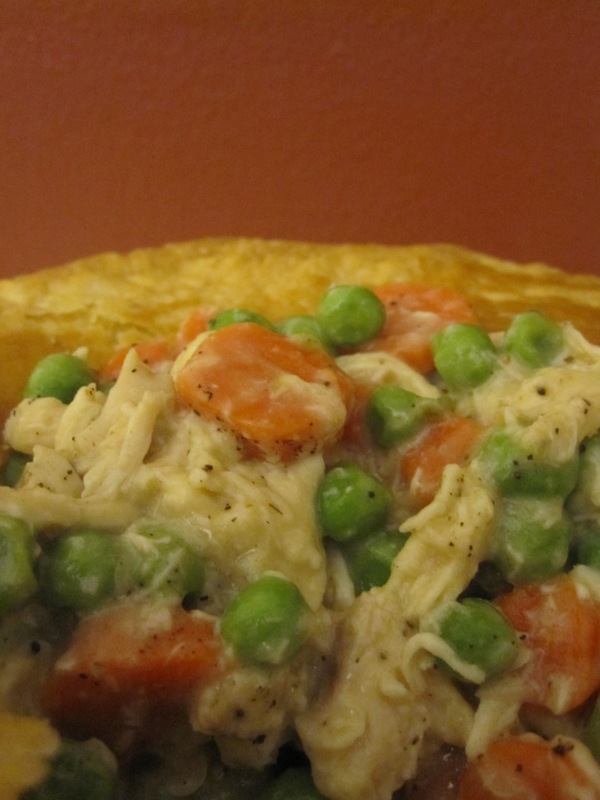 happy snow/chicken pot pie monday! Previous post: let’s talk about … dinner planning! Next post: monthly meal planning, take one!